At times, the Turtle has appeared in the Nauticans darkest hours and in their direst of needs. 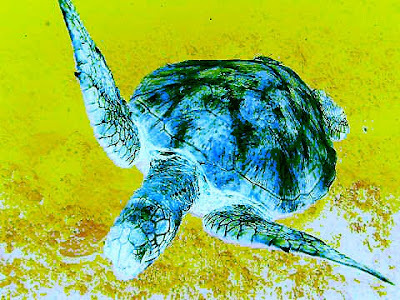 Whether this be a time or war, famine or disease, the appearance of the turtle seems to preceed a change for the better in Nautican fortunes. While Fortunis exists on the surface world he cannot be stopped by any means other than being 'slain' and thus dispatched back to his magical underwater world. The Giant Turtle can be engaged in close combat by those in base contact but is not subject to the normal combat resolution and does not provide any benefit for the Nautican army in multiple unit combats . The turtle will continue on it's path irrespective of the attacks against it. The presence of Fortunis benefits the army as a whole as it draws in the waves of magic to protect the Nautican forces. The very first unsaved wound caused during the battle against the Nautican army is always ignored as though it had been prevented by a ward save. *note: Fortunis himself cannot re-roll 1's only other Nautican Units ! ** don't forget, you can never roll a re-roll ! The above re-rolls are only applicable if a re-roll has not already been taken.